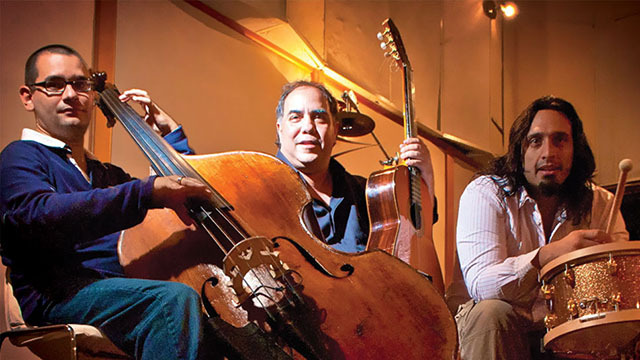 Local vocalist and composer Eliana Cuevas is joined by the virtuosic Venezuelan guitar and cuatro player Aquiles Báez with his trio direct from Caracas. Don’t miss this extremely rare opportunity to hear traditional Venezuelan rhythms in Toronto. The night kicks off with a set by Toronto-based Brazilian guitarist Wagner Petrilli. Admission: $15 advance $20 at the door Buy Advance Tickets Here! Following up on the success of his debut solo CD Confissão, Brazilian guitarist Wagner Petrilli was nominated for a 2015 Canadian Folk Award. Having studied with masters such as Filo Machado, Helio Delmiro and Celso Machado, Petrilli has been a central figure in the Brazilian music scene in Toronto for the past 18 years. With four full-length albums and numerous national and international tours to her credit, Eliana Cuevas has grown into an accomplished singer-songwriter and bandleader with unlimited colours in her compositional and lyrical palette. Eliana has performed and recorded with JUNO Award-winning artists Jane Bunnett, Jesse Cooke and Alex Cuba. Internationally-renowned Venezuelan guitar and cuatro master and Aquiles Báez brings his traditional and jazz fusion trio to Toronto for the first time. With seventeen albums to his credit, the outstanding composer and performer has recorded and performed with Paquito D’ Rivera, Danilo Pérez, John Patitucci, Aquiles Machado, Romero Lubambo and Richard Bona. Winner of the prestigious William Leavitt Award from Berklee College where he serves as a faculty member, Báez was featured in the music documentary Calle 54. Now in its eleventh year, the annual Lulaworld festival brings together Toronto’s finest world, jazz and Latin musicians presenting their latest compositions and projects and collaborating with celebrated international guests. The festival will include a day of free outdoor programming as part of Dundas West Fest on June 11. Lulworld 2016 includes CD releases, more than a dozen international guests, free concerts, family workshops and a huge Brazilian parade that YOU can be part of! Presented by Lula Music and Arts Centre the 2016 Lulaworld festival will highlight the incredible breadth and calibre of the Toronto world and Latin music scenes. LMAC would like to thank our funders, partners and sponsors for all their support.